In five days with TapRooT®, you will learn how to conduct an investigation and develop effective Corrective Actions. A TapRooT® course can accelerate your career and has proven a professional game changer for many. TapRooT® is designed for learners at all levels. You will learn to find and fix the root causes of incidents, accidents, quality problems, precursors, operational errors, hospital sentinel events, and many other types of problems. Techniques include: SnapCharT®, Root Cause Tree® & Corrective Action Helper® plus additional advanced topics such as CHAP, Human Engineering, Interviewing, Safeguard Analysis and Proactive Improvement. Upon course completion, attendees will receive a certificate and a 90-day subscription to TapRooT® VI, the online software service. Most importantly, you will have the advantage of professional training in your expertise and on your resume! We’ll meet on July 16 for the 5-Day Root Cause Analysis Training course. 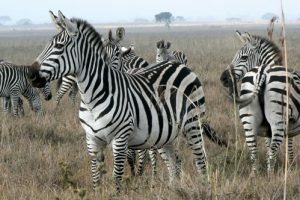 You will likely want to explore a bit of Nairobi so below we’ve included highlights of your host city. Register here to take the 5-Day TapRooT® Advanced Root Cause Analysis Team Leader Training in Nairobi. Nairobi is a modern African city with a colonial past. As Kenya’s capital, Nairobi is the most populous city in eastern Africa and a leading business, cultural, and financial hub in Africa. Nairobi offers parks, shopping, art museums, cultural attractions, restaurants and bars, and opportunities to get close to wildlife. Giraffe Center: Supported by the American Fund for Endangered Wildlife, the center offers you experiences in feeding, standing face-to-face with the giraffes, and walking the Giraffe Center Nature Trail. An endangered subspecies giraffe, the rare Rothschild, has been successfully bred at Giraffe Center. Get up close to baby elephants at David Sheldrick Wildlife Trust Elephant Orphanage. Only available for viewing from 11 am to 12 pm, so plan accordingly, the baby elephant orphans are found left behind when the babies fall into watering holes or when their mothers are poached. The handlers bottle feed them the only kind of milk the young elephants can have: elephant milk, of course. Nairobi National Park: Experience exhibits about Kenyan history and early African ancestry, cultures, and people. Learn about fossils and their names. Next door is Snake Park where some snakes are so poisonous, they are behind double glass! Stroll the botanic garden and trek the nature trail. 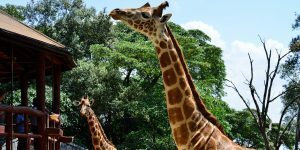 Nairobi National Museum: Explore gardens with sculpture, culture, and history in the midst of Kenya’s rich heritage. Kenyatta International Convention Centre: View the city from the heights of the conference centre with its dome-shaped tower. 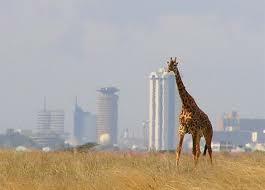 The Nairobi skyline is punctuated by the centre’s fusion of African styles, both traditional and contemporary. Masai Market: On Tuesdays, shop among handicrafts: sculptures, jewelry, batik hangings, apparel, sisal bags, and many other handmade selections. Also, check out the City Market. African Heritage House: The house overlooks Nairobi National Park and is a combination of diverse mud architectures across Africa. Karen Blixen Home: Built in the tradition of late 19th-century bungalow architecture, with spacious rooms, verandas horizontally laid out, a roof of tile and stone, at the foot of the Ngong Hills, the home was owned by Danish author Karen and her Swedish husband, Baron Bror von Blixen Fincke. 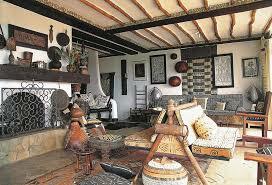 The Academy Award-winning film “Out of Africa” was about their lives in this home on farmland in Kenya. Carnivore: Set amid tropical gardens, with the rustic feel of a medieval banquet hall, Carnivore offers exotic meats, soups, side dishes and sauces, selection of desserts and Kenyan coffee. Try a classic Kenyan cocktail, Dawa, a blend of vodka, sugar, lime, and honey. 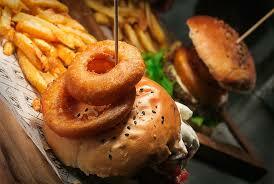 Talisman: A fusion of European, Pan-Asian, and African cuisine and considered one of the best restaurants in Nairobi. Try the grilled filet with a potato patty mixed with vegetables and deep fried, served with a wasabi-mustard sauce. Wasp & Sprout: A small cafe in the quiet Loresho area with excellent food and a relaxing ambiance. Visit during breakfast or brunch for ricotta pancakes, eggs Benedict, and baked goods. Bring a book and make yourself at home for a few hours. The Arbor: Set in a beautiful garden, the cafe is eco-friendly with Southeast Asian and international cuisine. Brew Bistro & Lounge: A popular restaurant, brewery, and lounge, with rooftop beer garden ambiance and a lively nightlife. Mama Ashanti: A local favorite with West African and Ghanaian fare. J’s Fresh Bar & Kitchen: In Westlands, this gastropub has outdoor seating, a DJ booth, nightlife and a full-service restaurant. Discover more to explore from our Nairobi Pinterest board and begin planning your TapRooT® trip to Africa today.